Alzheimer's disease is increasing unfortunately around the world. Is there any definite answer to stop the malady? No one seems to know its definite cause. Is it really one of the modern sufferings in the civilized world? Some scientists believe that a certain type of protein (Amyloid β-protein) settled in the brain is the cause of Alzheimer's disease. 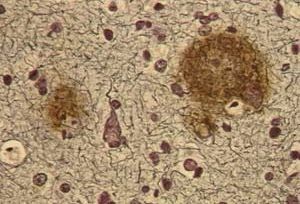 They found the Amyloid beta-protein in the brain of Alzheimer's patients through electron microscope. Normally, the amyloid beta is cleaned or eradicated by an enzyme called neprilysin (NEP) in the brain. However, the function of enzymes weakens with age, and will not be enough to eradicate the amyloid β-protein. That's how modern science set up its hypothesis. What kinds of symptoms are counted as having Alzheimer disease? People with Alzheimer's disease easily forget the date and time even a few minutes ago. Sometimes, they go out on the streets wearing a pajama or underwear. However, most of them can converse normally. Clinically, we believe that Alzheimer's symptoms appear slowly and take about 20 years to know the differences. If it takes that long, is there any method to find it before it is too late? Yes, there is a way, and this is done via CT Scan as seen in the photo below. 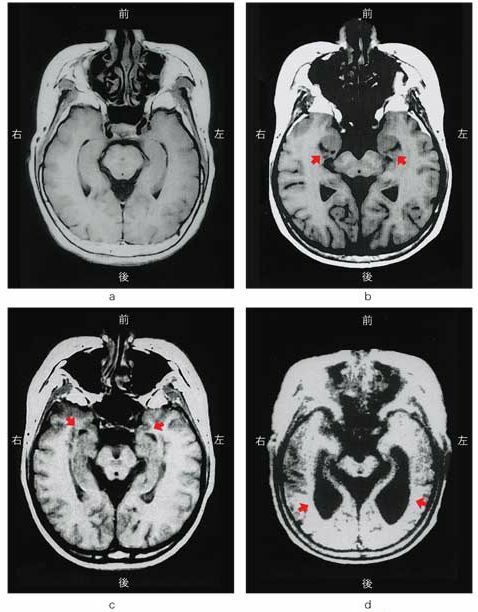 Photo (a) indicates normal brain. Photo (b) indicates melancholia; suffering from depression or depressive case. Photo (d) indicates the brain of Alzheimer's disease. Red Arrow mark indicates defective area. Most Alzheimer patients do not believe or do not think that they are suffering from Alzheimer's disease. Is there any medical technology that prevents getting Alzheimer's? We really do not know how excepting the application of PYRO-ENERGEN treatment. However, we can say that a simple daily exercise of brain as well as simple physical exercise can prevent the disease. Brain training or brain exercise includes having frequent conversation with friends or family. This will enhance the brain function and increase enzymes that eliminate the amyloid β-protein. We also know that daily 20 minutes exercise will help enhance the brain function and is considered one of preventive ideas. Medical groups of the world agree that brain exercise, physical exercise, and having conversations with friends and family are the best medicines to prevent Alzheimer's disease. Remember that high blood pressure or hypertension, high blood cholesterol, and obesity may also contribute to Alzheimer's disease. Please bear in mind that there are no good medicines or botanical herbs for Alzheimer's disease. Do not be fooled by commercials on TV and magazines! Also read article "The Cure for Alzheimer's Disease".